Monumental wall map of Itay. CARTA STRADALE E POSTALE DELL'ITALIA Disegnata secondo le Carte e le Opere più accreditate dei moderni geografi da CARLO CERRI nella proporzione di 1:804,000 del naturale l'anno 1852. This is the scarce 1859 edition of Carlo Cerri's monumental postal map of Italy. 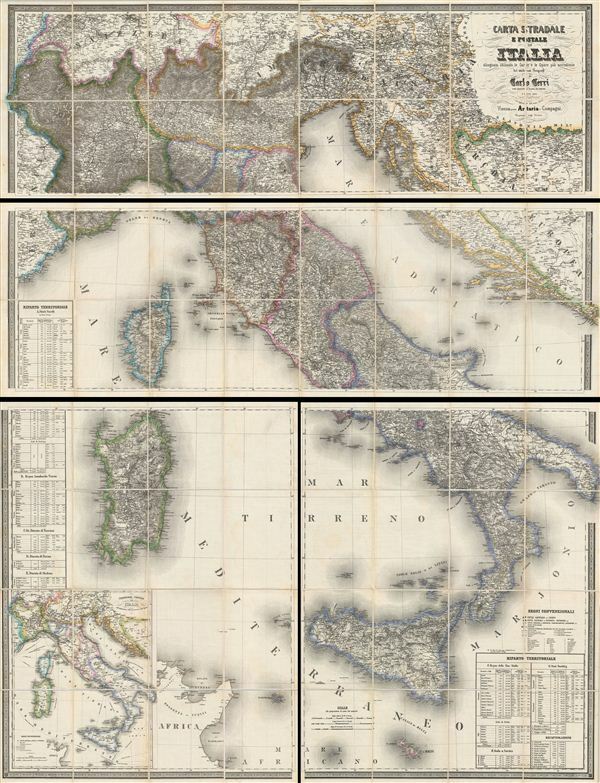 First published in 1849, this is one of the largest and most magnificent maps of Italy to emerge from the 19th century – the age of the Grand Tour. This particular example was updated from the 1852 edition. The scale is 1:804,000 and relief is shown by hachure. The chart is divided into four massive dissected linen-backed sections and folds out to a phenomenal 64 x 50 inches. The map offers extraordinary detail throughout naming every town and city in 19th century Italy from the largest capitals to the tiniest hamlets. Various roadways and important routs around the peninsula are noted. Offshore the map also notes various shoals and other undersea dangers. As this map was being printed Italy was in the midst of its struggle, under such figures as Garabaldi, for national solidarity. In, 1861, just two years after Artaria published this map, the various Italian states would finally consolidated as the Kingdom of Italy, which prospered until the republican constitution of 1946. A table in the lower right quadrant details population statistics. Printed by Artaria and Company, of Vienna, in Milan, Italy. Carlo Cerri (fl. c. 1840 - 1860) was an Italian engraver and cartographer active in the middle part of the 19th century. Cerri, who was based in Milan, issued a number of large scale maps of Italy geared toward state use, such as postal maps, and the "Grand Tour" tourist market. Artaria and Company (1765 - c. 1890) was founded by Carlo Giovanni Artaria in 1765 in Vienna, then the capital of the Austro-Hungarian Empire. Originally a specialty publisher of sheet music, including works by Hayden, Mozart, Beethoven, and Schubert, the company had expanded its business to include maps by the mid-1770s. The company collaborated with Joseph von Scheda and distributed maps for the Militärgeografischen Institutes. Artaria continued to be a major European publisher well into the 20th century. In 1920, the cartographic section was sold to Freytag and Berndt, who published under the imprint Freytag-Berndt & Artaria. Very good near fine condition. Comes with original marbled binder. Size indicated represents the total map size, not the individual sheets.